This rustic portion of Northern California is where you’ll find all of the great parks and ski spots. 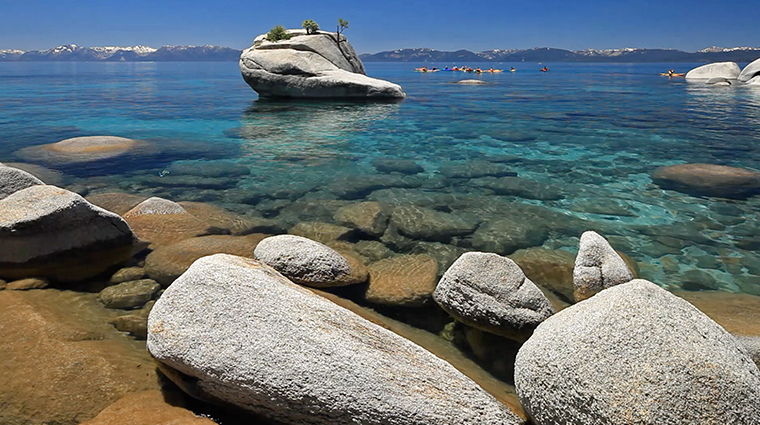 One of the most magnificent mountain lakes in the world, Lake Tahoe straddles two states and offers an abundance of wildlife and recreational opportunities. For a spectacular view, drive to the lake’s southwestern part where Eagle Creek, one of the thousands of mountain streams that feed the lake, cascades 1,500 feet into Emerald Bay. The curved roads circling North America’s largest alpine lake require some effort to navigate, but the shoreline’s varied activities — historic sites, hiking, skiing and casinos — make Tahoe a good bet. Near the south entrance of Yosemite National Park, Oakhurst derives much of its economy from tourists who come to explore the park. Located along Highway 49, the Gold Chain Highway, the area is filled with historic structures dating to the Gold Rush and is home to the lovely Forbes Travel Guide Five-Star Château du Sureau and Four-Star Erna’s Elderberry House restaurant. Of course, Yosemite is one of the most popular and best-known national parks in the world. John Muir, the naturalist instrumental in the founding of this national park, wrote that here are “the most songful streams in the world, the noblest forests, the loftiest granite domes, the deepest ice sculptured canyons.” Within 1,169 square miles, there are sheer cliffs, high-wilderness country, alpine meadows, lakes, snowfields, trails, streams and river beaches. Waterfalls are particularly magnificent during spring and early summer. More than 3 million people visit each year, but the views tend to distract from the crowds.